There are a lot of rock and roll superstars that today’s average rock fan never had the opportunity to see live, either due to drug overdoses (Hendrix, Tommy Bolin), car crashes (Marc Bolan), plane crashes (Ronnie Van Zandt, Randy Rhoads), or other tragedies. Then there are those rock heroes that remain alive, but just fade into oblivion, either because their current material isn’t popular enough, or because they just don’t care. Fortunately for fans of classic British blues-rockers Ten Years After, the heart of that band is still pumping–and with the same fury it possessed 15 years ago. That heart belongs to Alvin Lee, and last Saturday (August 8) at Expo Theatre it instilled real life into a crowd of 2,500 fans. When Lee ran onstage, bellowed “Are you ready to rock ‘n’ roll?”, and then headed straight into “One Of These Days”, it was like being transported back to Chillliwack Junior High, where we used to spend hours in the parking lot, playing air guitar to 8-track editions of A Space in Time and Ten Years After Recorded Live. Lee hasn’t lost any of the dazzling speed that made him such a huge fave back then, and on “Good Morning Little Schoolgirl” he showed that he can still use a mike stand to play slide. While introducing his version of “Hey Joe”, Alvin noted that “Everybody gets the blues–even on a sunny day.” Then he went ahead and blew those blues away with a killer solo that he played with a drumstick. “I’m gonna bring out my old Woodstock guitar for this one,” he announced, before using his trusty red semi-acoustic (with peace symbol stickers) to knock off “I’m Going Home”, tossing in bits of “Blue Suede Shoes”, “Whole Lotta Shakin’ Goin’ On”, and “Hound Dog”. For the encore, Lee played his trademark show-closer “Choo Choo Mama”, as well as a rowdy version of “Rip It Up”. He never got around to doing “I’d Love to Change the World” or “Rock and Roll Music to the World”, but no one was complaining. 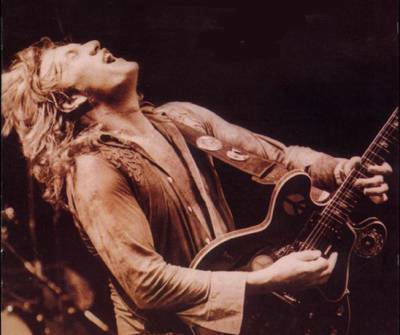 There was nothing to beef about, except that Alvin Lee should have been the show’s headliner. That honour went to John Kay and Steppenwolf, and though they also took minds back to the late ’60s/early ’70s, they didn’t do it with nearly the same authority as Lee. Oh sure, people danced in their seats to tunes like “Magic Carpet Ride”, “Born to Be Wild”, and “The Pusher”, but they do that every time the band hits town. For his part, Kay did look good dressed all in black, with black guitar and shades, strutting slow and cool the whole time. And the group’s choice of Argent’s “Hold Your Head Up” as an encore went over well with the crowd. However, the new material they previewed from their upcoming LP Rock and Roll Rebels sounded pretty average–and not the least bit rebellious. I’d much rather invest in a new copy of A Space in Time myself.